People have different ways of judging their financial health. Some judge it by whether or not they can afford a holiday. Some by if they can get that new laptop they've had their eye on. My aim is to have (or at least find) enough spare cash to change car as often as possible. And that's happened quite a lot: after nine years of car ownership, I'm now on number 12. I've sort of lucked into my latest purchase, coming into an inheritance. And sad though the loss was, suddenly having a pretty sizable wedge of cash dropped into my lap was something of a relief. Because I could finally afford to get rid of my knackered old Focus. Actually, that's doing it a disservice as it had hardly had an easy life. Even though it was only an 05-plate, it had already done 99,000 miles when I bought it nearly two years ago, which is a lot for a 1.6 petrol. I added another 17k, so it was starting to feel decidedly decrepit. And that wasn't all. It always suffered intermittently from an oddly strangulated power delivery that I never got to the bottom of. Equally, the clutch and gearbox always felt like they were on the cusp of exploding. And since it was a three-door, it wasn't really practical enough, either. But the biggest problem was that it was frankly rather boring. Brilliant sure, but boring. There just wasn't anything about it that hooked into my emotions. In every quantifiable way, it was a fantastic car. And of course, being a Focus, it was huge fun to hammer down a favourite Yorkshire moorland road. But there was no soul, no character. And I just can't put up with that. So what to replace it with? I set myself a budget of £7,000 and decided I wanted rear-wheel-drive and six cylinders. Only two cars fit the bill: the BMW 130i and the Nissan 350Z. But the Nissan is only a two-seater and the BM's ride is intolerably hard (at least in M Sport trim, which was all I could find). So they were both out. 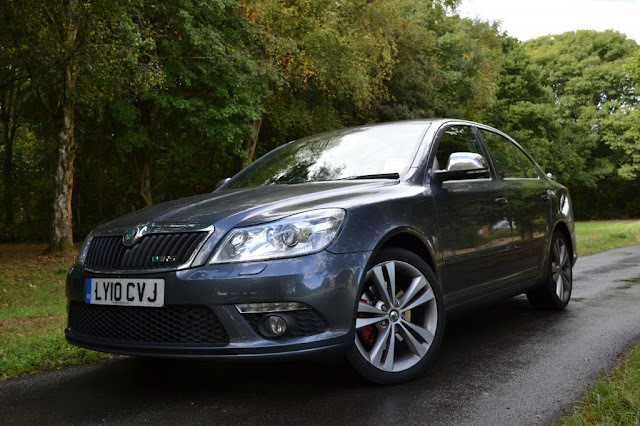 I scoured the interweb for something else and boiled my options down to one car: the Skoda Octavia vRS. It ticked all the boxes. It has four doors, it's not that expensive to run and, crucially, it's pretty rapid and a decent steer. I found one on a 10-plate at CarGiant in London (amazing place - literally thousands of cars to choose from and a completely pain-free buying process) and snapped it up as fast as I could. Even the fact it had 85,000 miles didn't put me off. After all, I was getting it three or four grand than cheaper than it'd be with average mileage. And if you didn't know, you couldn't tell - it's as tight as a drum. Two weeks and 1,200 miles later I'm loving it. Inevitably there are a few niggles. The throttle pedal is hinged on the floor, which is taking some getting used to - I keep putting my foot on the wrong part of it, so pulling away gets a bit jerky, plus it makes heel-and-toe downshifts virtually impossible. The brakes are hard to modulate if I stand on the pedal, too. And the handling seems to work on a need-to-know basis. But that's it. In every other way, it's pretty awesome. It's plenty fast enough, with a particularly fullsome mid-range that makes overtaking an absolute doddle. It's very comfortable, despite the 18-inch wheels. The grip in bends immense. There's enough space in the back to swallow a large easy-chair. The stereo's fantastic. And it's even only a couple of MPG less economical than the Focus. Basically, it's a hugely capable thing. But that list is rather rational. And you never love anything on a rational basis, least of all cars. You love something because of its character, which is something my Octavia vRS has in quantities the Focus could only dream of. The exact nature of that character is a bit hard to pin down, but let me ask you this: do you have a friend you've known for years, you can't remember why or how you became friends but you always have an amazing time with them? The Octavia vRS is that friend. Here's to a long and happy relationship.